But critically, until the very end the film never quite manages to give us a real sense of the man whose life it celebrates. Kevin de Paula, cast as the teenage Pelé, manages the headers, the stunning kicks, and the amazing moves that made the Brazilian athlete world famous, but he can’t seem to bring that childlike sense of elation for the game that separated him from all other players.For that reason alone, the film works but never flies. I’m going with three out of five for Pelé: Birth of a Legend. Right from the outset, this film goes for the mainline in terms of making an emotional connection with the audience. A lot of time is devoted to depicting Pele’s childhood and his passion for the game. Indeed, he was so poor that even purchasing a football was out of his financial reach. What can bog the film down at times though is that it can get a bit heavy-handed.But having said that, the good points outweigh the bad, and if you’re a football fan, you’ll realize why football’s ‘the beautiful game’ description came to be associated with Pele. 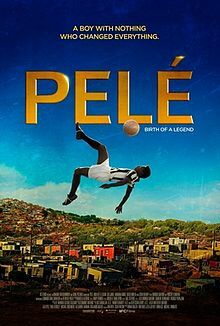 Pele’s meteoric rise from the slums of Sao Paulo to leading to Brazil to its first World Cup victory at the age of 17 is chronicled in this biographical drama.